So we need to make a few directories for the next step. Pick a directory (I used "work") where you'll be dumping the processed files. 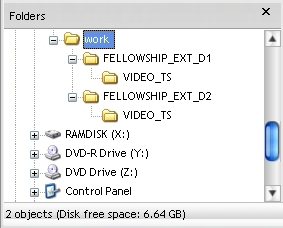 Within that directory, you need to make two new directories (I used "FELLOWSHIP_EXT_D1" and "FELLOWSHIP_EXT_D2" for this example. Then, within the two directories, make one called "VIDEO_TS" in each as I have depicted below.